Taxpayers Oughta Know – How Much Of Our Defense Budget Is Spent On Dry Ice? Max Impact answers the call to motivate and inspire the newest generation of professional Airmen. 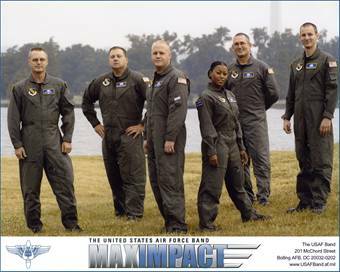 To achieve maximum results Max Impact stays on the leading edge of the ever-changing pop music scene while projecting the highest standards of Air Force professionalism. Optimal delivery is the name of Max Impact’s game when it comes to serving its audience. With innovative style and boundless energy, Max Impact commands the stage encouraging every Airman to embrace the spirit and join the fun. Collateral Damage would be a better name.